Samsung is going to launch a few ‘A’ series phones this year like the Galaxy A10, A50, A60, A90 etc. and we already know a few details of some of these phones. Today, however, a reliable source revealed something really interesting. The Samsung Galaxy A90, according to the source, is going to be the company’s first phone to feature a pop-up selfie camera. Again, it is the ‘Samsung’s First’ phone with a pop-up selfie camera and not ‘World’s first’. The concept of a pop-up selfie camera is not new since we saw some phones like Vivo NEX, Oppo Find X etc. Companies go for a pop-up selfie camera to remove any cutout or notch from the screen and make it as much bezel-free as possible. Samsung was the first company that launched a phone with a hole-punch screen but the Samsung Galaxy A90 will go a step further and will have no cutout or notch on the front for the front camera. 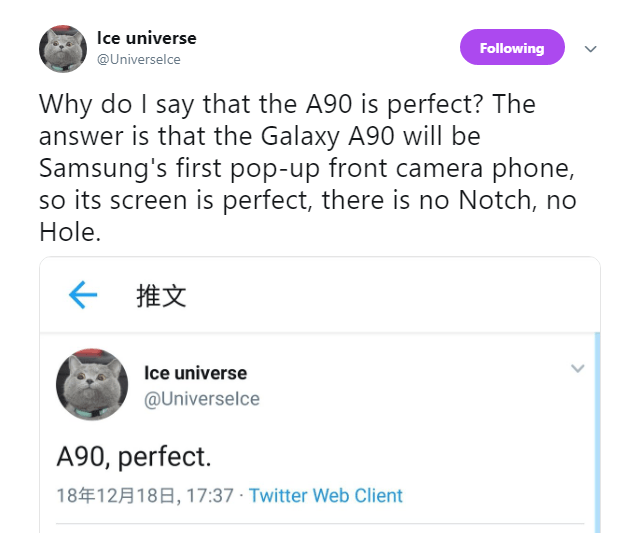 From the design to the specifications, nothing is known about the Galaxy A90 at the moment. Stay tuned.